More than year ago I’ve played a little with Android Java SDK and I’ve created proof of concept of Meteoapp application. It fetches an meteograms from new.meteo.pl, cuts them into 6 parts and displays choosen parts for a given city. 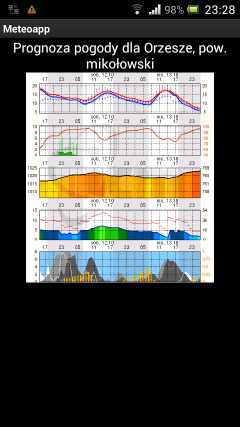 Meteoapp uses meteo library to interact with new.meteo.pl. This library has been also open sourced. I use this app a lot. In fact it’s useful only for Polish people, but maybe someone would like to install it or even hack with the code. This is great Wonderful Mobile Application development.. Interesting ideas.. Thanks.